15 months is here already! This little girl is growing fast! And she just keeps getting more fun! She loves dancing to music and sitting at her table. She has a fascination with chairs and getting into any she sees. She loves dressing her baby doll up and pushing her in the stroller. I occasionally am asked to “nurse” her baby dolls and animals these days when she’s needing some mid day “milky milk”. Daddy and I get lots of hugs and kisses from our sweet girl and we are also learning how to gently ease her through some tough moments as well. Toddler tantrums are in full swing as well. She’s so full of life and energy, it’s hard not to smile when you are around this little girl. We are loving her up! * Every month I will be taking a photo of Ellie in her rocking chair with her “Pink Baby” (or any toy she deems worthy at the moment). 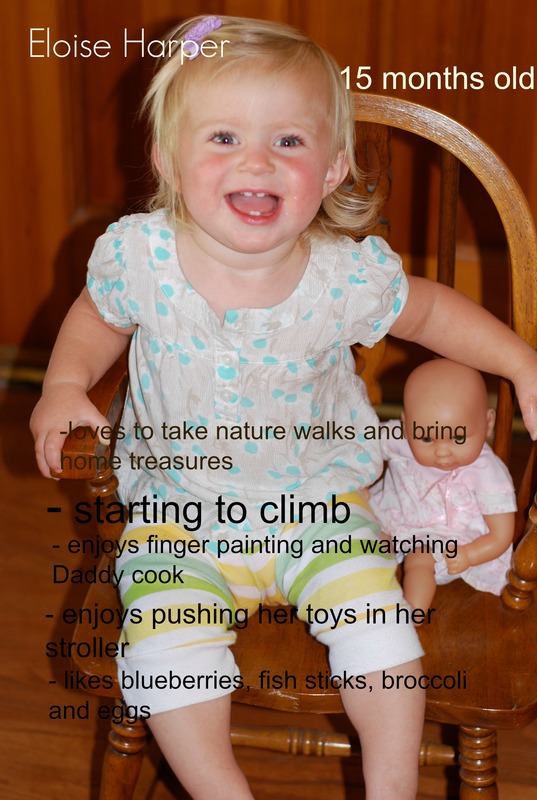 This entry was posted in Eloise's Monthly Photo and tagged 15 months, Eloise's monthly photo, portrait. Bookmark the permalink. She is so cute, it gets me every time I see her smile! I am truly jealous she is starting to climb, our 12 month old won’t stop climbing everything to the point our dining room chairs have had to disappear down the hallway and we have to shuffle them back every time we want to eat. Good luck with the tantrums mama! It’s a strong learning curve and growing experience for everyone.. not to mention the biggest test of your patience.